Hail Mary, full of grace. Our Lord is with thee! Blessed is the fruit of thy womb, our Lord Jesus Christ! O Virgin Mary, Mother of God, pray for us sinners now and at all times and at the hour of our death. Our Lady Virgin Mary is of Juda's tribe and the descendant of King David. She was born in 14 B.C. and was her pious parent's, Yovagim and Hane, the only daughter. When she was three years old, her parents took her to the temple of God as a vowed to Him and they died. The priests and pious women brought her up. They taught her the worship, the virtuous deeds, the Hebrew language, the Old Testament, spinning wool, and weaving linen and silk until she was fourteen. Then she was espoused to a veracious man called Joseph the son of Jacob, who was a relative of her. The chief of angels, Gabriel announced to her the descent of the Holy Ghost on her and the birth of Jesus the Redeemer of the world by her. She was pregnant and gave birth to Him while she was virgin in a heavenly miracle which astonished the world. She brought Him up in the house of His foster father Joseph. where He lived. She glanced His first miracle, heard Him preaching His gospel and saw His crucifixion and death in flesh. She believed in His resurrection and witnessed along with the apostles His ascension to heaven and the descending of the Divine Spirit on the day of Pentecost. She lived in the house of St. John the apostle to whom our Lord Christ entrusted her when He was crucified. He took care of her and she persisted on worship and meditation in the heavenly mysteries until she died. The holy apostles conducted the funeral service with a great pomp and her virteous body was buried in Jessemany Village outside of Jerusalem. Afterwards God carried her to His heavenly paradise. This was around 56 A.D. in the sounder novals, after she had lived most probably 70 years. Our Lady the holy Virgin Mary, the Bearer of our Lord Jesus Christ, the Incarnated God, has a lofty position in Christendom higher than that of the angels, prophets, apostles, martyrs and doctors of the Church, because God has chosen, purified, sanctified and preferred to her to all women of earth. She is the diadem of the virgins and the crown of the Christians. Elizabeth the aged mother of St. John the Baptist called her 'Mother of God' (St. Luke 1:43). St. Mary is the mediator for all grace and advocate for all the devotees before God. The historians and narrators have registered the different graces and miracles that the believers had won through her. Millions honour her with sweetest songs and seek refuge in her intercession. The Syriac Orthodox Church calls Mary, 'Mother of God' ('Theotokos'), because she gave birth to Christ, God truly incarnate. She is revered as perpetual virgin and mother of God; and she is first among the saints. However the concept of Immaculate Conception for St. Mary is not accepted. According to the teachings of the Church, God is pleased to respond to petitions offered to Him routed through the intercession of St. Mary the Virgin Mother. This was the constant teaching of the holy fathers since the beginning of the Christian Church. 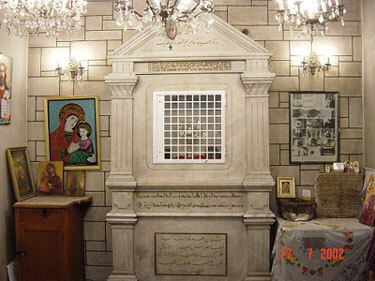 The Syrian Church opens her daily worship by glorifying the Almighty God. After that She uses special invocations in which she praises our Lady the Virgin, and seeks her meditation, in the night, morning, and evening prayers except the most of the lent days. Besides, she recites in her festivals, prose invocations and chants wonderful hymns in which she describes her high virtues and everlasting merits, in a way that captivates the minds and delights the ears. In the sacramental services and prayers of the Church from the early periods, the mediation of St. Mary was an integral part. 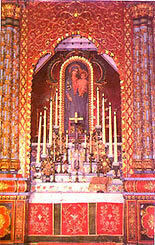 The altars of the churches are sanctified invariably with the name of St. Mary over and above the other saints. In our common prayers the Lord’s prayer beginning “Our Father which are in Heaven etc” is generally followed by a repetition of the message of angel Gabriel - St. Luke 1:28- Hail Mary etc and the words of praise of Elizabeth - St. Luke 1:42 - “Blessed are you among women and blessed is the fruit of your words.” We finish it with an appeal for her mediation on our behalf for ever before Almighty even at the moment of our death. In the Syrian Orthodox Church, along with the Holy Mass a textual prayer service in the name of St. Mary is generally conducted at the request of devotees for St. Mary’s intercession. The text for this can be seen in the book of ‘Qurbana Kramam’. In Malankara it was first published in Syriac by St. Gregorios of Parumala at the behest of Patriarch of Antioch and All the East. Among all the churches of Kerala, the St. Mary's Jacobite Syrian Orthodox Church at Manarcad near Kottayam has a very special place. Millions visit this church seeking her intercession, more particularly on the 8 day-lent period in September, commemorating her birth. May God accept her mediation for the world, Amen. The Church has the rare privilege to have with her the Girdle of St. Mary. The Girdle of Virgin Mary was handed over to Apostle St. Thomas, during her assumption to heaven. St. Thomas carried this precious treasure of Virgin Mary with him to India where he died a martyr. In 394 A.D. together with the coffin of St.Thomas, this valuable Girdle of Holy Virgin Mary was also moved from India to Raha and was established in a Church. (In the Syriac history of Raha, it is mentioned that in Aug 22, 705 Greek era they brought the coffin of St. Thomas the apostle to his large church in the days of Mar Kora, the bishop of Raha. Ref: The Orien Biblio of Assimaany, Volume I, page 399). This Church where the Girdle of Virgin Mary was established came to be known as the "The Church of Girdle". In those days this was erected a small and simple church as a cellar under the ground because of the violence of paganism on Christianity in the first three centuries, and some forefathers consigned in it the valuable girdle of St. Mary as a precious treasure to the believers. But over a period of time, the church had lost track of the girdle. In mid April 1953, while scrutinizing some manuscripts, a Garshunian book containing stories and speeches was noticed by the supreme head of the church, Patriarch His Holiness Ignatius Aphrem - sent by the people of Homs in 1852, to the believers in Mardin. It appeared to be bound with many papers piled up over each other and was very old. 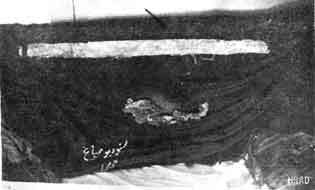 In it was fourty six letters in Garshunian and Arabic concerning the diocese of Homs and environs written a few centuries ago by the notables of the archdiocese of Syria to the notables of the city of Mardin (Turkey) close to Za'fran Monastery, the Patriarchal See, implying the conditions of their archdiocese. 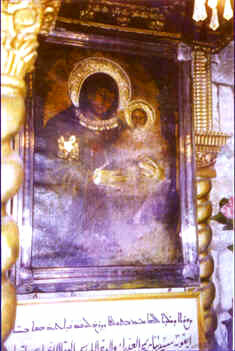 They included that while wrecking their church called in the name of the Virgin the Lady of the girdle in Homs for the purpose of enlarging and renewing it due to its oldness, smallness and its wooden ceiling, by the order of His Eminence the Archbishop Peter Mousally (later Patriarch Ignatius Peter IV), they found the girdle of our Lady the Virgin put in a vessel in the middle of the holy table in the altar. They were comprised with happiness and blessed by it. According to these information's, on the 20th July 1953 A.D., in the presence of His Lordship Alexandros the Greek Orthodox bishop of Homs and other prominent persons, Patriarch Aphrem I opened the Holy Sanctum and was discovered that in a marble plate it was written that ‘This church was built in the time of the preacher called Malaya, [Elijah] in AD 59”. They also found a stone vessel and a silver vessel and in it was found the Holy Girdle wrapped on itself inside a vessel which broke due to its oldness. Together with it was also found a thin metal pipe in the upper part of the vessel containing a hollow bone that seemed to embody a piece of parchment or thick paper which was left as it was. The Greek Archbishop and other prominent persons who were present witnessed this fact and attested to it. As the news spread, researchers questioned its authenticity. They examined it and were unanimous in their opinion about its genuineness and about the age of the girdle. Now it is kept in this church which is from very earlier times known as "The Church of girdle" or "The Church of the Lady of the Girdle". Multitudes of Syrian believers and people from different Christian denominations and of all over Syria, Lebanon, Iraq and other countries, come to enjoy the sight of this sacred relic and seek its blessings with Christian desire and piety. 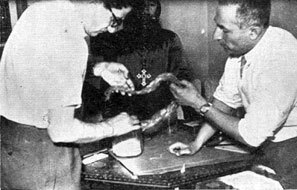 In 1982, during the Patriarch Ignatius Zakka I Iwas's Holy Apostolic visit to Malankara, His Holiness brought a portion of the girdle and was established in many churches in Malankara, all attained special importance henceforth. 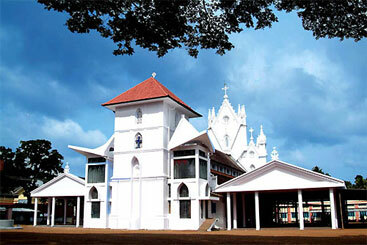 The famous Morth Mariam church at Manarcad, Soonoro church at Cochin etc. are some of the prominent churches in Malankara where the Girdle of Our Lady Virgin Mary is established and people pay due respect.